Dining at Coda Restaurant on the rooftop of Aria Hotel in Prague. Of all the restaurants I’ve eaten at in Europe, Coda Restaurant in Prague is one of the eateries at the top of my list for favorite restaurant views in Europe. That in itself may be enough to stop by here for a meal, but combine the view with an excellent menu and it’s a can’t-miss culinary experience in Prague. When I arrived at Coda Restaurant, which is located in the music-centric Aria Hotel, the hostess gave me the option of sitting in the dining area or going up to the terrace. I glanced into the dining area, which looked quite alluring and had an intimate feel with a touch of romanticism. I also appreciated the shades of blue in the décor as it’s my favorite color – and not one you see in restaurants much for some reason. So I was briefly tempted to eat in the dining area, but then I remembered that it was a lovely day outside that for once wasn’t too hot (it was the middle of an August heat wave in Europe) and so I opted for the terrace. Though as luck would have it, I wound end up getting to experience both the indoor dining area and the terrace. But first, up to the terrace I went. The elevator doors opened up in front of a few steps that lead up to the terrace. Just from the limited view I had from the elevator I could already tell choosing the terrace was a wise decision. 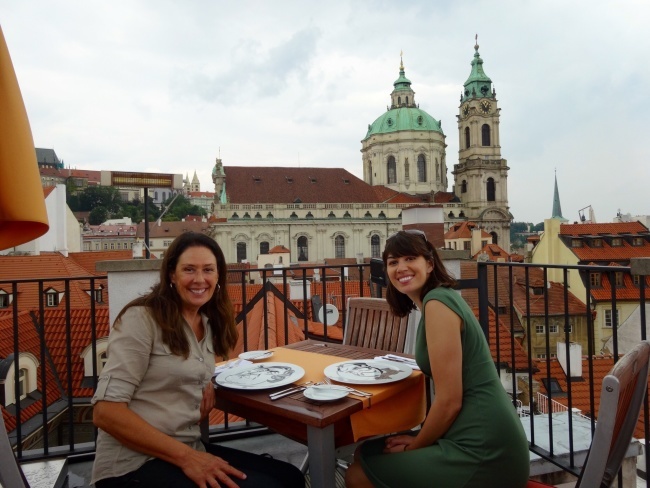 I walked up the steps and had a stunning view of the terracotta colored roof tops of Prague. Part of the reason Prague is so loved is due to its medieval and Gothic architecture and Coda Restaurant provides views of this aspect of Prague at an ideal height and angle. You feel snuggled into the architectural history of the city from one of the canopied tables that spread out along the narrow terrace. Upon being seated at Coda, the first thing you’ll notice are the very cool plates. They’re designed by Josef Blecha specially for Coda Restaurant and feature the Rosenthal caricatures of famous musicians – which keeps with the musical theme Aria Hotel is known for. The plates also gave a fun, unexpected vibe to what is otherwise a very elegant restaurant, helping to put diners into a relaxed state of mind. The plates can be purchased in the hotel gift shop. Once I tore my eyes away from the view and stopped gushing over how fun the plates were, I perused the menu. It had a degustation menu with multiple courses that came with wine pairings and also a la carte options. The chef for Coda visits farms every week and is always trying new menu items that bring fresh, local ingredients to the diners of Coda. First came the Monkfish with mango. It was an ideal choice for the day since it was still a hot day even if it wasn’t breaking into the 90s, and the mango gave it a refreshing taste. Next up came the ravioli, which had a surprisingly light taste considering it was mostly pasta and cheese, and once again was a welcome treat on the hot day. For my entrée, I ordered the goulash because…when in Rome…and when in Prague you should try the goulash at some point. This course was HEAVY. I enjoyed it’s hearty, savory flavor, but it definitely had me wondering how I was going to keep sightseeing after lunch. I didn’t have much time to wonder that though because midway through the main course the sun suddenly disappeared, a harsh wind came up and a few minutes later the terrace began getting pelted with rain. Our polite and professional server, Michal, immediately appeared with covered trays and instructed us to head down to the dining room where he’d be with our meals shortly. I’m not sure what they do when it rains and the restaurant is full (I was told dinner time is nearly always full), but I was quite impressed with how quickly they had us moved and set back up downstairs. The indoor dining area at Coda Restaurant. We finished our meal in the soothing blues of the indoor dining area while I questioned once again my decision not to get a glass of wine as the wine list featured several local wines from the Czech Republic (especially whites) plus many others from around Europe and a couple from Argentina and California. But, the rest of Prague was waiting for me to explore and I didn’t want to get drowsy so when we left Coda and Aria Hotel later on with our bellies full, I was ready to keep exploring Prague with the gorgeous views from Coda’s terrace still playing in my head. But before I left I enjoyed this (of course!) musical dessert. Note: I was provided a complimentary meal at Coda Restaurant, however my review and opinions of the restaurant are — as always — completely my own.